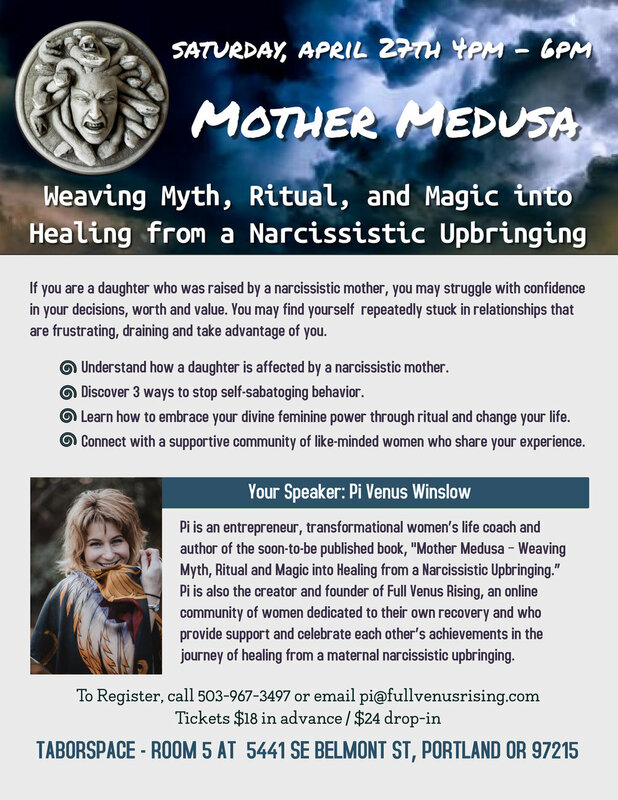 Saturday, April 27th, 2019 from 4pm to 6pm at Taborspace Room 5 - Join Pi Venus Winslow for an intimate introduction to her work empowering women to weave myth, ritual, and magic into healing from a narcissistic upbringing. This live 2-hour event will offer participants an opportunity to be seen, heard and validated if they have suffered a narcissistic upbringing and it will provide valuable insight as to how to end unconscious self-sabotaging beliefs and behavior. Alternatively, you can purchase tickets by contacting Pi to register by calling 503-967-3497 or email pi@fullvenusrising.com.